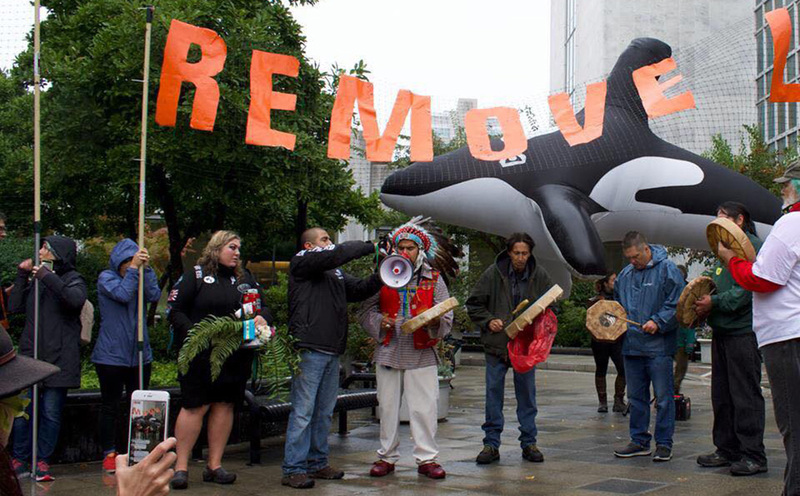 Demonstrators gather Oct. 5 at Holladay Park in Northeast Portland with giant salmon and orca balloons to call for the breaching of lower Snake River dams. Many of the demonstrators carried signs, some singling out Army Corps of Engineer officials. Rally organizer Michele Seidelman has been organizing weekly overpass actions to build momentum for the rally and plans to return to the Army Corps building every week until the dams are breached. Seidelman said she is driven by a personal bond with the orcas and her certainty that they cannot survive unless the lower Snake dams are removed. “There’s a 2002 environmental impact study that taxpayers spent millions on, and it’s just sitting there gathering dust. They’ve used all the options except option No. 4, which is to breach. And they need to breach this year. The people who can make this decision are working in this office,” Seidelman said. Each of these claims is disputed by Jim Waddell, a retired Army Corps engineer who worked on the Army Corps’ breaching study in 2002 and now runs the website DamSense.org. Waddell said he has documented communications with then-Assistant Secretary of the Army Jo-Ellen Darcy, confirming that the $33 million study he worked on is still the framework for ongoing decisions at the Army Corps – meaning the agency can use its breaching option without delay. 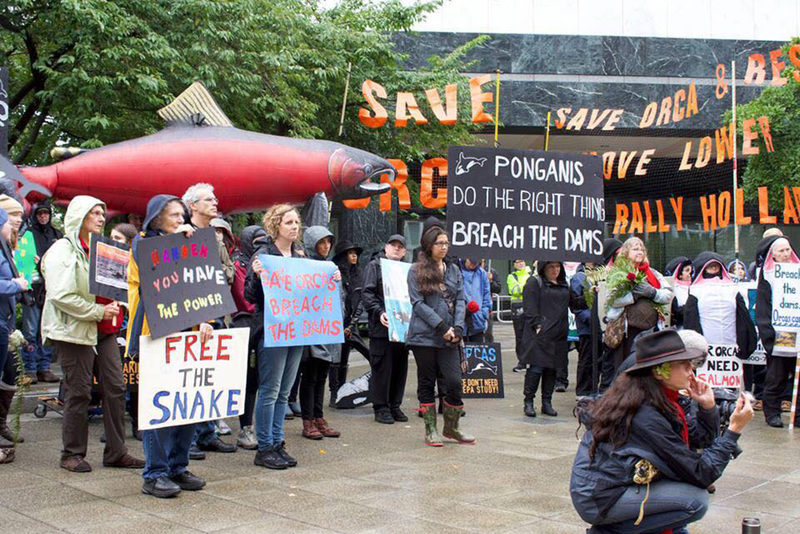 Demonstrators gather Oct. 5 at Holladay Park in Northeast Portland with giant salmon and orca balloons to call for the breaching of lower Snake River dams. Schuster spoke to the crowd about how the lower Snake River dams came to be built and what they cost her family. Widely opposed initially for their threats to fish and wildlife, construction began on Ice Harbor dam in 1955, Lower Monumental dam in 1961, Little Goose dam in 1963 and Lower Granite dam in 1965. A fifth dam was proposed but was ultimately defeated. Like the orcas, Schuster and other local people had much of their food on the Snake River obliterated by the dams – as well as homes and villages buried beneath reservoirs. One 1999 report produced for the Columbia River Inter-Tribal Fish Commission showed that 90 percent of the salmon originally harvested by the Nez Perce Tribe in Idaho had been lost since European contact. The same study referenced an interagency scientific study called PATH, originally funded by Bonneville Power Administration, that found breaching the lower Snake River dams created the best chance of recovering endangered salmon in the Snake River – with an 80 percent likelihood of success.